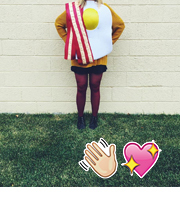 These are so much more than elephants in silly outfits. 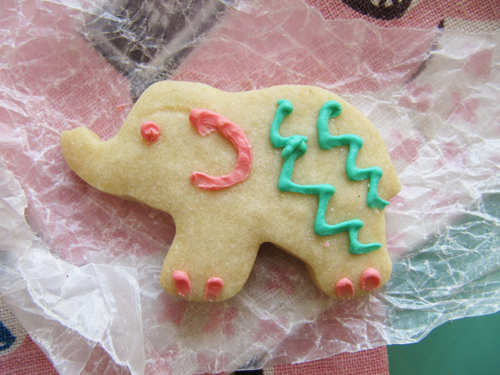 They are elephants that taste like shortbread and are wearing Christmas colors. …well, my idea of a Christmas colors remix. I’m thinking these will be cozy tucked in a cookie box with these cookies and these ones and maybe some sort of lollipop, and maybe even fudge! What are you guys baking this year? Tell me everything. Preheat oven to 300° F and line two baking sheets with parchment paper. Cream together the butter and sugar. Add remaining ingredients and mix until a lovely dough forms. Roll dough out until 1/4″ thick. Cut with your favorite shape. Bake for 20-30 minutes depending on if you’re baking small cookies or large cookies. They are done when your kitchen smells like heaven and the edges are just beginning to turn golden brown. Cool completely before frosting. 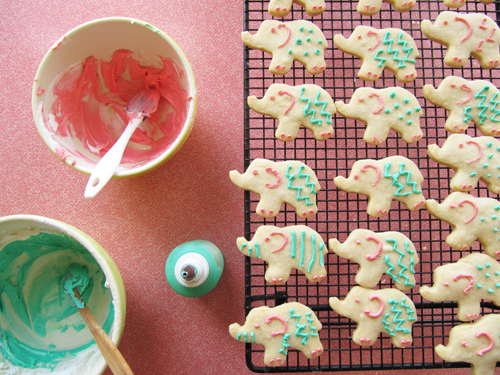 Make your royal icing and color to your hearts content. Pipe onto shapes. These are beautiful as snowflakes with glitter sprinkles to boot! my nails match their outfits! I like your christmas colors remix! these are going to be so cute in your cookie boxes…whoever gets them are lucky ducks! oh my goodness, i’ve already baked so much! i’m having a “champagne & cookies” party on saturday. sugar cookies, gingerbread cookies, pretzel m&m cookies, peppermint bark, coffee toffee, peanut butter truffles. my freezer is bursting! haven’t made shortbread though, so maybe i can fit these in!! That sounds like the most fun party ever! Oh your menu sounds awesome too. 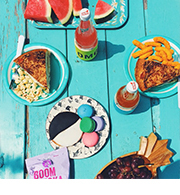 I’m totally interested in the coffee toffee. yum! 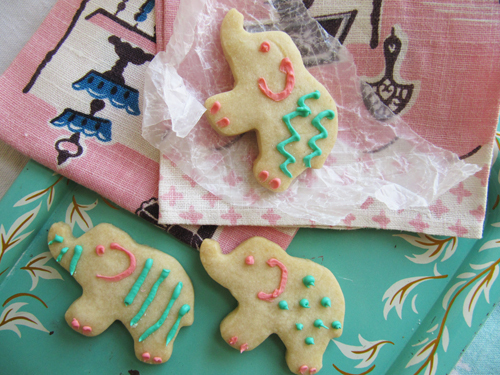 Now I know what Christmas has been missing all of this time…elephants! These are crazy cute and I love the icing colors! I’m not sure of all of my holiday kitchen adventures, but for sure there will be German stollen and peppermint bark. Oh man. Now I just want peppermint bark! These little guys are too cute. I already did so much baking for christmas! Cute little sugar cookies with royal icing, cranberry orange pinwheels, oatmeal chocolate chip cookies, peanut clusters (made them in the crock pot! it was madness), and these peanut butter chocolate chip shortbreads half dipped in chocolate. I think I did 300 cookies all together. Luckily my Grandma totally helped me with those. I love these cookies..and yes, I made the sparkly *snowflake* variety…large and small..and a few tiny mittens with sparkly red trim…yum! Your elephants are adorable!! 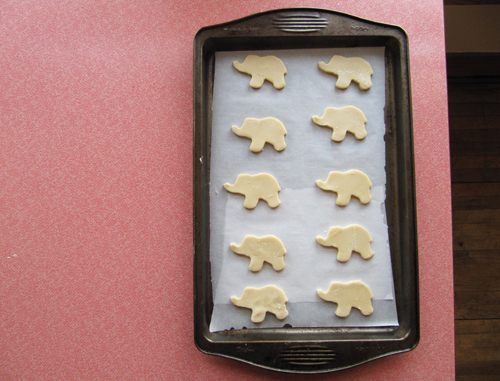 elephant cookie cutters are the best! Love the elephants, super cute! So far I’ve made Nigella’s Christmas Puddini Bon Bons, chocolate peppermint candy cane cupcakes, tonight I’m thinking of doing the mint oreo chocolate truffley things and some homemade Irish Creme. I’ve been asked to make boozy Egg Nogg and Bannoffee pie for Christmas day … Plenty of kitchen time for me. Yay! Dana – yes! I can’t wait to make other things elephant shaped. Jay – Thanks man! Whoa! You’re totally on top of christmas baking. Way to be.